I love how fast it is to make, yet adds that touch of special to your breakfast. There are many recipes out there, but this one is my favorite. Feel free to fancy it up with strawberries,or other fruits, but I keep it pretty classic! Mix all ingredients in blender or rocket style blender until ice is crushed and is smooth (I do like a few little ice chunks in mine, though!) Serve immediately! Jan's tip: Can you use regular orange juice instead of the concentrate? 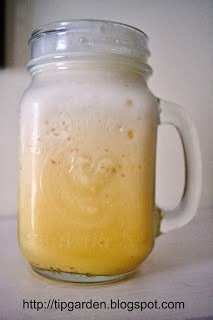 Yes, but you'l lose a lot of the orange flavor, I really recommend using a small can of thawed orange juice concentrate. How do you make your Orange Julius?